Christopher James Pegues was born on 22 May 1807 in Cheraw District, South Carolina. On 12 March 1830, James Pegues recorded in his plantation day book: "Christopher very sick with 'pleuresey' sent for doctor." The following appeared on 8 September 1832 in The Winyaw Intelligencer: In the House of Representatives, December 8, 1832. The committee appointed to draft resolutions, and appoint managers of elections for the next general election, Report the following resolutions: Resolved, That the elections to be holden on the second Monday in October next and the day following, for senators and members of the house of representatives, shall be holden at the following places, and conducted by the following persons: . . . For Marlborough Dist. At the Academy near William's mill, J. B. Billingby, Christopher J. Pegues and Oliver H. Corlock. . . . He married Ann Elizabeth Cosnahan, daughter of Bartholomew Cosnahan and Sarah Crosland, on 29 January 1833. The following is an abstract of a petition was filed 11 January 1842 in the Equity Court, Cheraw, South Carolina: William Crosland prays that the sale of a slave belonging to his ward, Joseph B. Cosnahan, be confirmed. Crosland represents that Joseph’s former guardian, Christopher J. Pegues, left for Alabama a number of years ago, taking with him one of Joseph’s slaves named Lindy. It was Pegues’s intention to come back and fetch Joseph and the other slaves as soon as the term for which the slaves had been hired had expired. However, Joseph became unwilling to follow Pegues to Alabama, and Crosland was therefore appointed his new guardian. When Pegues offered to buy Lindy from Joseph, Crosland was initially "at a loss" whether to send for the slave and bring her back to South Carolina or to sell her to Pegues. However, considering the funds needed for Joseph’s education and with Joseph’s assent, he decided to do the latter. In 1838, he sold Lindy and her child to Pegues for the sum of $700. He now seeks an order of the court confirming the sale. Christopher James Pegues and Ann Elizabeth Cosnahan appeared in the US federal census of 1 June 1850 in Old Spring Hill, Marengo County, Alabama. Other members of the household included Rebecca Cosnahan Pegues, James Bartholomew Pegues, William Crosland Pegues, Jane Elizabeth Pegues, Mary Ramsey Pegues and Edward Christopher Harder. Christopher James Pegues and Ann Elizabeth Cosnahan appeared in the US federal census of 1 June 1860 in Linden, Marengo County, Alabama. Other members of the household included William Crosland Pegues, Jane Elizabeth Pegues, Mary Ramsey Pegues and Edward Christopher Harder. 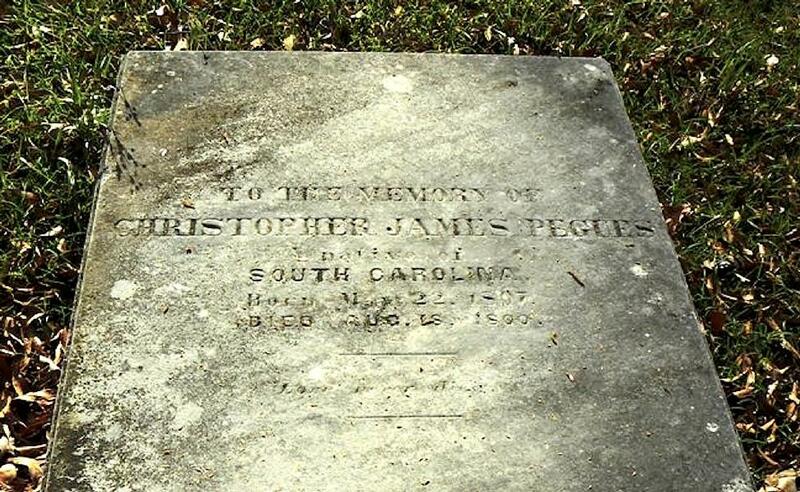 Christopher James Pegues died on 18 August 1860 at age 53 in Mobile, Alabama. His wife Ann Elizabeth Cosnahan became a widow at his death.